DV Series of small-frame vibratory rollers includes DV23D and DV26D double-drum and DV23CD and DV26CD combination rollers. Each has a 33.5-horsepower engine and selectable dual frequencies of 3,480 and 3,960 vpm. Operating weights are 4,920 pounds for the DV23D, 4,600 pounds for the DV23CD, 5,490 pounds for the DV26D, and 5,170 pounds for the DV26CD. Operators can choose between automatic or manual vibration engagement, and the rollers have offset tapered drums. A 50-gallon water tank with a pressurized water system is standard. 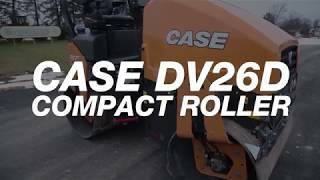 DV Series rollers are compatible with the Case Ace Force Intelligent compaction system, which is designed to improve compaction quality, requiring fewer passes to reach target specs and resulting in savings in time, fuel costs, and machine maintenance, according to the company. Ace Force also generates reports for applications where records of compaction performance are required. Iso-mounted operator platform minimizes vibration, and a standard lateral-sliding seat provides visibility to the drum edges on both sides of the machine. Watch the Case walk-around below.